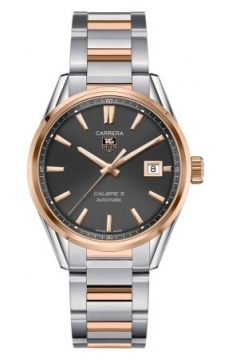 Buy this new Tag Heuer Carrera Caliber 5 war215e.bd0784 mens watch for the discount price of £3,017.00. UK Retailer. Looking to buy luxury watches not listed? Call us free in the UK on 01442 345261 to see if we can help. *Did you purchase this at The Watch Source? I have read and accepted the Terms for posting this rating and/or review. Post a public question about this product. An accepted question and its answer are generally posted in 2-4 business days. I have read and accepted the Terms for posting this question. Please fill out the information below to check the availability of an item. We'll respond to you shortly with availability and shipping information. Thank you! We will respond to you shortly. To learn more about this Watch, please fill out the form and we'll respond to you shortly. For immediate assistance, please call us on 01442 345261. Availability Estimated 4 Day Delivery Want it sooner? 18ct polished solid rose gold bezel and crown. Anthracite dial with applied beveled fine brushed and polished gold plated indexes. Polished gold plated hour and minute hands with luminescent fill. Date window at 3 o'clock with beveled gold plated frame. Stainless steel finely brushed and polished bracelet with 18ct rose gold center links. Tag Heuer Caliber 5, beats at 28800 vph, & has an approximate power reserve of 38 hours. TheWatchSource.co.uk has chosen not to be an authorized dealer of any brand name manufacturer. Being an authorized dealer requires us selling watches at the manufacturers set retail price. TheWatchSource.co.uk offers a 2 year warranty from the date of purchase - unless stated otherwise. The warranty covers malfunctions due to manufacturing or material defects, battery replacement & water resistance under regular use within the manufacturer’s specifications. The warranty does not cover damages such as scratches, finish, crystals or glass, leather or fabric straps, damage due to excessive wear & tear, damage resulting from wear under conditions exceeding the watch manufacturer's water resistance limitations & damage due to physical and/or accidental abuse. Neither our own warranty nor the Manufacturers own warranty covers these items. All warranty repairs must be handled directly through TheWatchSource.co.uk. Watches opened or repaired by any other source will void all warranties. TheWatchSource.co.uk will cover all parts and labour or replace the watch at our own discretion within the warranty period. All warranty returns must have a Return Authorization No. (RAN#). Please call 01442 345261 prior to return for RAN#. This number must be displayed on the outside of the box. A watch returned without authorization will be refused. See Return Policy for full details. Postage & insurance costs for warranty returns to TheWatchSource must be covered by the customer. Returns must be sent via a traceable & insured, reliable method (Do not return goods via FedEx, FedEx does not insure watches or jewellery valued above £50). Return postage must be pre-paid and fully insured for the amount you expect to claim – In case of loss or damages, you the customer is liable. In some circumstances TheWatchSource is able to provide a Worldwide covered authorized dealer stamped warranty card, in which case the watch will be covered by the manufacturers stated warranty. When the manufacturer’s warranty is included with the watch, pen or watch winder - warranty service shall be handled directly between the customer and the manufacturer via any authorized dealer. The watch will include a manufacturer’s original endorsed warranty card. The WatchSource warranty will not take effect if the watch supplied to you comes with the original manufacturer’s warranty. However we are always keen to look after our customers so feel free to contact us with any issues or questions you may have. Although a watch may be rated 30m/99ft water resistant, it does NOT mean that the watch can be immersed to that depth. The depth rating posted by the manufacturer is theoretical in nature and can only be achieved in a perfectly optimum environment of a laboratory which is impossible to replicate in real life.